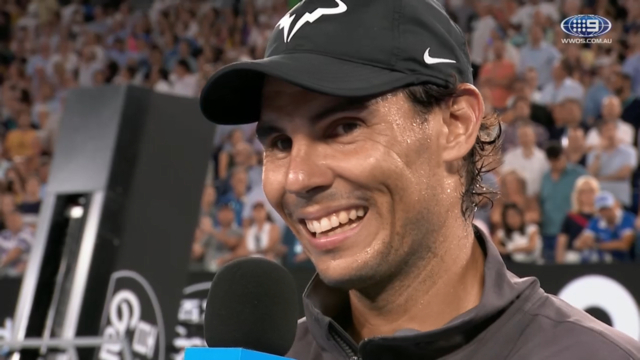 A hyped up Rafael Nadal credits an improved serve with his rampage to the Australian Open final. The world No.2 hasn't dropped a set en route to the final - and much of that is down to the Spaniard's super serve. The 2009 Australian Open champion hasn't been broken since his opening-round clash with wildcard Australian James Duckworth, five matches ago. Fellow Australians Matt Ebden, Alex de Minaur, former Wimbledon finalist Thomas Berdych and next-gen hopefuls Frances Tiafoe and Stefanos Tsitsipas all failed to crack the claycourter. In Thursday night's brutal 6-2 6-4 6-0 dispatch of Tsitsipas, Nadal was particularly dominant, failing to give up a break point until the match's final game. The 32-year-old said it was pivotal to ramping up his attack on the young Greek. "I can do that damage little bit earlier than before because during this event I have been serving great," he said. "When you serve great, then the first ball normally is a little bit easier." Nadal contrasted his play with that of his great rival Roger Federer, who has traditionally edged the Spaniard when it comes to serving. "I can't play like Roger when I don't have the serve of Roger. You know, Roger (gets) a lot of free points, have lot of times that he starts with the serve, then he have a not-very-difficult forehand," he said. "Was not my case during all my career because I never had that serve. "I am not doing serve and volley. I am not hitting winners every ball. But I play all the shots with a goal. "There is not better way to be aggressive than hit every shot with the goal to create damage on the opponent. That was my goal during all the career." For Nadal, it's all part of staying at the top of the game as he attempts to win his 18th major - an astonishing 14 years since his first came at Roland Garros in 2005. "I have to adapt my game to the new time and to my age, that's all. That's what I did during all my career," he said. "That's the only reason why at this moment I am still here competing at high level. "I know during that 15, 16 years, 17 years of tennis, professional tennis career, I'm going to lose things on my way, so I need to add new things." Nadal will either renew his long-time rivalry with world No.1 Novak Djokovic or play Frenchman Lucas Pouille in Sunday night's final.